Nov. 11, 2014 4:00 a.m. 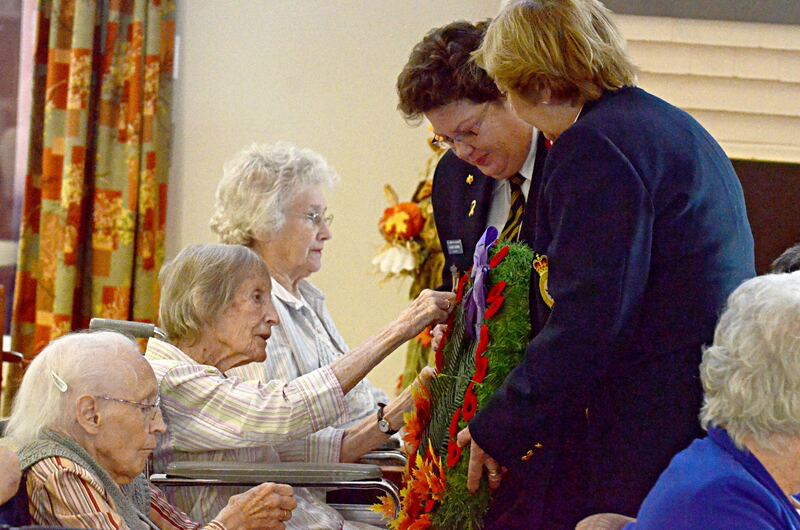 Residents at Aldergroveâ€™s Jackman Manor seniors home welcomed members of the local Royal Canadian Legion branch a day early, with a service of remembrance on Nov. 10. The service has been going on for 31 years, ever since Jackman Manor opened. Itâ€™s held for residents who are unable to get outside on Nov. 11 due to mobility issues. Reverend Linda Varin led prayers and Legion member Bob Bradley read the poem Why Wear a Poppy, and John Loxterkamp read an excerpt from Laurence Binyonâ€™s poem For the Fallen. After the moment of silence, Legion members carried a wreath around the dining hall and allowed the seniors to pin their poppies to it. Richard Toms, Shirley Henry, and Mary Janik were among those who listened to the service. For Toms, it was his first time seeing the Remembrance Day services in Jackman Manor, as he just moved in this past April. Heâ€™s always tried to go to Remembrance Day ceremonies in the past, he said. Janik has also gone to Remembrance Day services for many years. â€œMost of my family were in the wars,â€ she said. Uncles and cousins served in the military, she said. Last Friday, the residents at Jackman decided against their end of the week craft (baking cookies), and created a Remembrance Day display in one of their common rooms, said activity coordinator Barb Stamelias. â€œI was really touched,â€ she said. Jackman Manor is currently home to three veterans, along with some residents who grew up in countries affected by the war, such as Holland.